What is a spice, a vegetable, and a condiment; is used as a colorant, a pest repellant, a preservative, a weapon, and in medicine? The answer to this riddle is the irreplaceable chile pepper. 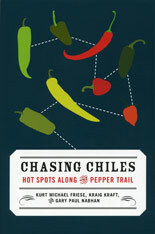 Its increasing prominence in cuisine and precarious position in current climate conditions inspired a yearlong odyssey for three “gastronauts”—agroecologist Kraig Kraft, chef Kurt Friese, and ethnobotanist Gary Nabham—who traveled through pepper-growing regions in the U.S. and in Mexico in a van they dubbed the Spice Ship. Their goal: to learn about the effects of climate change on food diversity, using America’s rarest heirloom pepper varieties as the test group. Their method: to meet with those most affected, the farmers and chefs for whom the pepper crops are a source of livelihood. 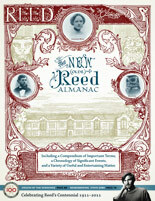 More than a travelogue, the book includes the history of peppers, recipes for local dishes that use them (try xnipek, Mayan for “dog’s nose”), and numerous sidebars, such as those contributed by Kraig for the datil, habanero, tabasco, and New Mexico chiles (his favorite from his formative years in the state). Kraig majored in biology at Reed and earned a PhD at the University of California, Davis, focusing on the origins and diversity of wild and domesticated chile peppers. He also writes about chiles for a number of magazines and journals (see also Kraig's blog). What the travelers conclude from their journey leaves the reader with hope: the response to unpredictable weather lies in increasing plant diversity. As one Sonora resident notes, “climate has been changing all along,” and we have no other option, but to keep growing.